Open windows – We get quite the variety of weather this time of year in Mokena. That said, there are plenty of warm days on tap. Try getting into the habit of opening windows for about 10 minutes every day. For one thing, doing so helps lower concentrations of toxic chemicals, as well as carbon dioxide. Keep cigarette smoke out – We touched on this in a previous HVAC repair post, but it’s worth mentioning again. Here’s something you probably didn’t know: the smoke you exhale after taking a drag on a cigarette contains more than 4,000 different chemicals. Do you really want those dangerous chemicals circulating everywhere in your home? Make it a point to ask any household smokers to go outside when they need to light up. Keep the house clean – It’s impossible to keep every dust particle out of your home. But that doesn’t mean you shouldn’t keep a tidy house. If you don’t already, try vacuuming and mopping the floors at least once a week. It’s also a good idea to ask guests to take off their shoes. Track humidity levels – Mold and dust mites absolutely love humidity. What’s so bad about these pollutants? The fact is that some molds can have adverse health effects such as allergic reactions and asthma attacks. Our advice is to use a dehumidifier that effectively controls moisture and allergens. Purchase air-filtering plants – Some houseplants have been known to eliminate toxic agents such as benzene and formaldehyde. Though these plants are only capable of removing a small rate of pollutants, it can make a difference in your home. Consider an English ivy or a Florist’s chrysanthemum to help enhance indoor air quality. Mokena residents have trusted Allegiance Heating & Cooling for nearly two decades. If you’ve been searching for contractors to assist with AC repair or heating repair, look no further. We understand how frustrating it is to be uncomfortable in your own home. 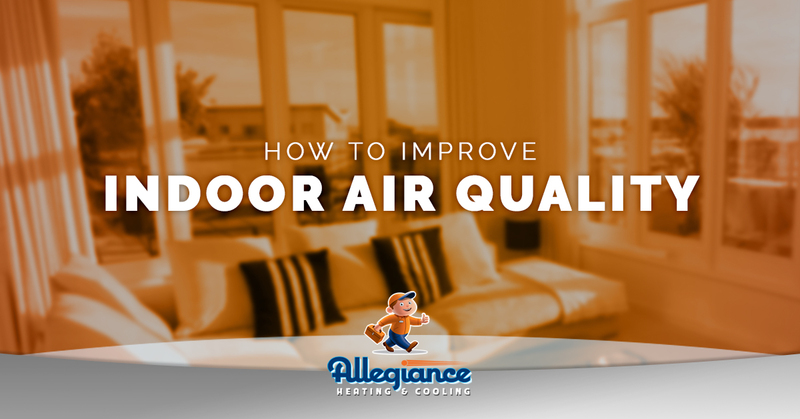 Our seasoned HVAC service professionals take all air quality dilemmas very seriously. You can count on us to first assess your system, determining the root of the problem. Unlike other HVAC companies, we don’t just try to sell you on expensive equipment. We will do everything possible to find a long-term solution that won’t break the bank. Our mission is to be your trusted home comfort partner. Experience the Allegiance difference.